Undoubtedly this reflects my own bias on the matter, but it seems to me that food is the most consistently available pleasure in life – and therefore, of utmost importance. Sometimes I am a teeny tiny bit envious of people who don’t really care about food – primarily because they tend not to have to worry about creeping weight -- but mostly, I just feel sorry for them. Food is love, and it is also comfort, and furthermore, it is the basis of most social life. In my home, it the basis of all social life. Even if we have to eat after 9 pm, we will all sit down together for dinner. I can be a slapdash housekeeper, and I will never wow anyone with the artistic beauty and originality of my domestic arrangements, but I do promise tea and cookies. I am a cook who believes more in coziness than in perfection. I am more about the kitchen than the dining room. When I think of the food that I like best, words like nourishing, wholesome, comforting, savory and nostalgia come to mind. I would rather have a good recipe for soup that anything super-fancy. When friends or family eat at my house, they tend to say, sometimes bemusedly: Did you make this? Invariably, the answer is yes – because I have a deeply rooted belief that homemade food is just better. It tastes better, and it is better for you, and therefore it is worth the extra effort. I think of myself as a “good plain cook,” but I realize that these terms are all relative. We all have our own mental parameters of what is too much bother and what isn’t. To my mind, making your own pie crust or lemon curd or fresh tomato sauce isn’t a bother. I think nothing of making my own meringues or choux pastry or cheese straws. (However, I would draw the line at croissants and pannetone, recipes that I’ve tried once but don’t intend on repeating.) On the other hand, I’m not that interested in preparations that involve beheading, deboning, or filleting. I once took a course on cutting up fish, only to conclude that I am just the sort of person who would rather buy my meat and fish ready for purpose. Some people probably become interested in cooking by default – because there is no one else to do it, or because they are raised on such bad food that they rebel by learning how to prepare food properly. Mine was the opposite case. I grew up in a home that smelled (and tasted) of good food. I remember coming home from school and smelling the heavenly winey aroma of a rich spaghetti sauce boiling away on the stove. I remember waking up in the morning, after one of my parents’ dinner parties, and greedily feasting on the cream puffs my mother had saved for me. I remember honey whole wheat bread, English muffins, and my mother’s special angel biscuits: all of those warm, yeasty smells. My mother particularly loved to bake and wasn’t that fussed about appetizers . . . and I have inherited these same tendencies from her. Although I spent a few college years living off of baked potatoes and bean and cheese tacos, it seemed inevitable that I would eventually acquire a KitchenAid mixer and a shelf of cookbooks of my own. When I was a child, I used to sit in a gold velvet armchair and read cookbooks by the hour. I particularly enjoyed Helen Corbitt’s books – because she told great stories, had a strong point-of-view, and believed in the importance of soup, rolls and dessert. Also, she made it sound like so much Fun. She took great delight in feeding people. When I think of the food writers that I enjoy today – whether it is Nigella Lawson in London, or Rebecca Rather in Fredricksburg, Texas – I realize that they have those same qualities. Very few cooks are inventors; most of us are just collaborators. I tend to get inspired by recipes, but then I go off-piste . . . partly out of necessity (maybe I don’t have all of the ingredients), and partly because I want to substitute according to my own eating preferences. I tend to favor the food writers who insist that every recipe is just a starting point. I also like the term “foodie,” because it suggests that the truly important thing is just having an interest in and appreciation of food. The best thing about collaboration is that it never really stops; I would like to think that every blog post is also the beginning of a conversation. When Julochka and I started talking about the idea for this new blog, the word “inspiration” kept coming up. Seasonal food, specific books or writers, our own food histories and stories, food politics, new techniques, adventures in growing and making food from scratch . . . these foodie matters are all part of the mix. We all have to eat, but what a vast world there is between sustenance and sensuality! I think that food, whether it costs you in time or money or both, is the most vital luxury. I'm SO excited about this blog collaboration. I foresee it being wonderful for my cooking inspiration and terrible for my thighs! What would we do without food. it should be wonderful food wherever possible. This promises to be wonderful. Molly - We promise to write about wonderful food that will benefit you in every way (without thigh increase). The Redhead Riter - Exactly what we are aiming for! One Planet - I've just read Julie Powell's newest, Cleaving. There's a review in that. Elizabeth - Yes, I think that we can encompass the weird and awful. As long as it's funny, why not? I look forward to all that you have to offer! Looking forward to great recipes and a lot of good writing on food history. Really looking forward to this! Even though I'm not a cook, I think I can get really inspired by this! this is beauty. food is glorious! i feel that even a plate of cure meats and cheese can be a symphony. when i open a cookbook, my insides warm. there are no memories, like the memories created over food ; )... spaghetti and meatballs, a bowl of sherbet, a slice of boysenberry pie or a creamy mac and cheese. oh, i can't wait to see what you lovlies, have brewing. I think I'm one of you. Yesterday I made: pizza, cookie dough, chicken stock and banana bread. I have a floor to ceiling bookcase of cookbooks. And we always use cloth napkins. I made beef and black bean enchiladas last night from a Cook's Illustrated recipe. Cooking is craft and delight for me, the older I get. I'm excited to see the first post here! Onward B and J! What a great post. It captures so much of how I feel about food! I read somewhere recently that a "foodie" is someone who's simply interested in the latest food fads, but that's not my understanding of the word at all. I've always thought of it as you do: someone who enjoys food (and eating). It doesn't have to be fancy food or fashionable food, it just has to be good food. Preferably earnest food, made with care--and made with an appreciation for the ingredients and the people with whom it will be shared. Anyway, enough of my rambling. Looking forward to your new adventures here! This is such an exciting new site. I'm a deboner and deheader and filleter (with stock pan and sizzling shallots ready to collect the detritus). My mental block is delicate puddings - I'm a "feel" cook rather than a measurer and exacter (for which read lazy and clumsy). I can't wait to see where this leads us. Lisa - I know you don't have a lot of time to cook, but at least you can read and drool, right? Tracy - I'd love to know what interests you about British food. Christina - You should do a guest post on food memories. Yum. Magpie - Yes, you are definitely a domestic sensualist. No doubt about it. 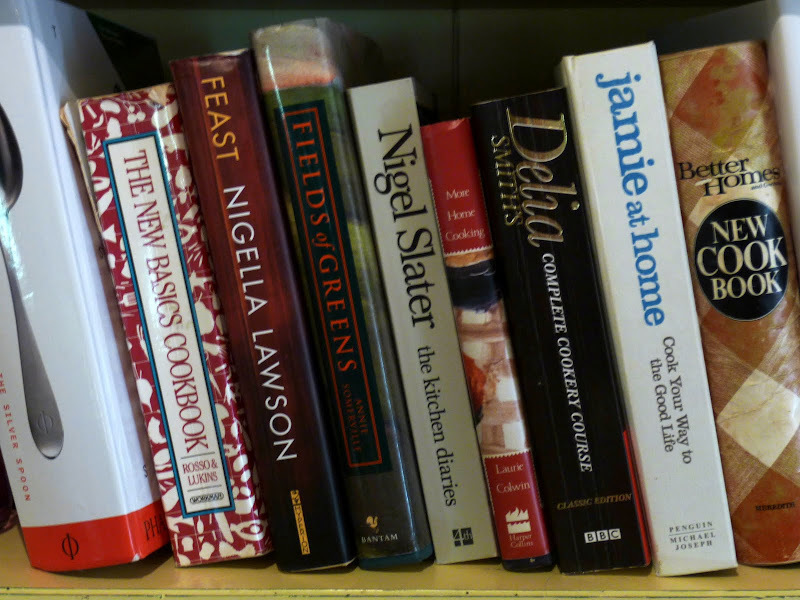 I want to know all about your favorite cookbooks. Nimble - It is so satisfying, isn't it, to say: I made this and it was great. And then I GET excited about cooking dinner and it is no longer a hideous chore. Anne - EXACTLY. You are my very favorite food blogger, you know. A's shoes - Let's expand each other's repertoires then. Thanks for the input! Spud - You are our ultimate challenge. We will not be defeated! You are so sweet, Bee! Thank you. By the way, regarding fresh-for-ages white bread: this morning my cubicle-mate was telling her husband (over the phone) what she wanted him to get at the grocery store, and one of the items was Wonder bread. *blink* I know I live in a bit of a foodie bubble, but honestly, it hadn't occurred to me that some people still made a conscious decision to buy Wonder bread! Lovely lovely lovely. I'm a fan already. I love to Cook to provide comfort and wonderful family memories. Many of the same cookbooks are on my shelf too! So looking forward to it! How simply glorious. I shall be your number one fan.